The apartment is located within the residence trinacria holiday home (it consists of different types of apartments, shared pool, garden and parking). The two-room apartment is located on the garden level, consisting of a double bedroom with bed double and possibility 'to add a cot / crib for children, kitchen-living room with sofa bed, bathroom, private terrace with table and chairs, sea view and Etna. The terrace at the garden level is a perfect place to stay with your children or just enjoy a few hours of relaxation caressed by the sea breeze. From the pool you can admire Mount Etna, in the garden there is a picnic table. Stayed for a week at the start of June. Apartment ideal for 2 people, with clean and basic amenities ensuring a comfortable stay. 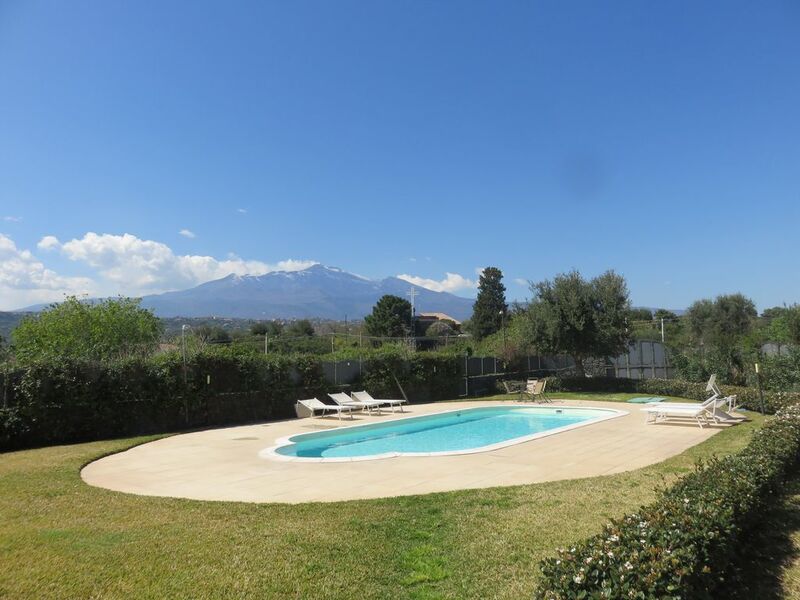 Excellent patio to relax with a sea view, with a 2 second walk to a fantastic pool area with Etna backdrop. Elvira was fantastic as a host, accessible everyday, and ensured we had an additional night when EasyJet cancelled our flight! Thanks Elvira! Very nice property with informative meet and greet. Had a great time and with in one hours drive you have more beautiful destinations.high light was Etna and wine tour. Had such a great tour guide named Tony. A must do . Traumhafter Garten, schöner Pool, gute Lage für Ausflüge. Wir waren Ende September für eine Woche vor Ort. Die Beschreibung der Anlage im Internet trifft absolut zu. Wir können die bisherigen, sehr positiven Kundenrezensionen uneingeschränkt bestätigen und die Anlage guten Gewissens weiterempfehlen. Noch einmal ein herzliches Dankeschön an Elvira und Anthony für die nette und kompetente Betreuung. Sollten wir noch einmal in diese Gegend Siziliens kommen, versuchen wir uns wieder dort einzumieten. The fraction of S. Tecla offers a long coastline of lava rocks on which wooden platforms are installed to access the sea easily, a pebble beach is present in the village. You will find a supermarket, three pizzerias, 5 restaurants, bars. In summer, the village square is a place of festivals, events or gathering together to stay in company.